JSender - Email Marketing Blog: JSender for Google Apps! We are excited to announce that JSender has been integrated to Google Apps now! It's a great chance to expose JSender's service to more than three million businesses running Google Apps. Make sure you get the admin rights of your Google Apps domain. 1) Go to our listing in Google Apps Marketplace. 4) Grant the "User Provisioning (Read only)" rights to us. 6) You can go to our application in the universal navigation bar of Google Apps' menu. What is "User Provisioning (Read only)" right? "User Provisioning (Read only)" is the right to retrieve all your user's basic information in your Google Apps domain. We request for it because we can enable you to control the access rights of your user to JSender. You may not want all your staff members getting rights to access all your marketing department's campaign, right? 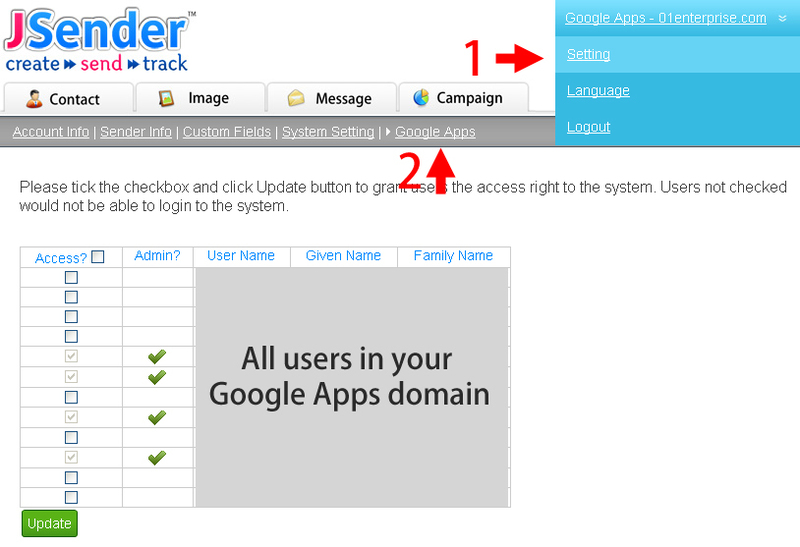 Will JSender directly access our Google Apps setting? We just retrieve all your user's name only, no other information will be passed to JSender. We will not (and can not) directly access your Google Apps setting (therefore, in Read Only mode). How can I manage my Google Apps users to access our email marketing campaign? 2) Go to Google Apps sub-menu. You can manage all your users to access JSender by selecting the Access checkbox.